You know those lines on wood? That’s called the grain. If you’re sanding or cutting wood, it’s easier if you do it the same direction as the grain. But easier isn’t always better. If you do something different from what’s expected, or oppose something that’s widely accepted, you’re going against the grain. Going against the grain isn’t easy, but it can be rewarding. It’s often how new ideas get started. 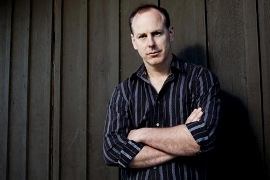 Greg Graffin is the singer of the popular punk band Bad Religion. He is also a science professor at UCLA. He has made a long and successful career of going against the grain, which was actually the title of a 1990 Bad Religion song and album. The band’s latest album, and Greg’s new book, also use the concept of against the grain. English, baby! met with him as he was autographing books. Jason: So, Greg Graffin, or Dr. Greg Graffin, scientist and singer, your band Bad Religion has an album called “Against the Grain.” Can you tell us, for people learning English, what does that phrase mean? Greg: The idea of against the grain probably comes from an ancient source of stories dealing with fish in a stream, and the idea that it’s easier to swim downstream than to go upstream when the water is flowing. In the song “I maintain against the grain” is this idea that as life propels you in one direction, it’s always more rewarding to try and go the other direction to search for knowledge. Jason: You’ve played music a lot of places all over the world. Is there a particular country where the punks are against the grain a little bit different than in other places? Or are punks kinda the same across the world? Greg: Well, that’s a tough question. I think that one interesting thing that unites all punk rockers is the idea that going against the grain is something valuable. Challenging authority doesn’t mean destroying it for nihilistic purposes, but challenging it in the hope of finding a better solution. Jason: You just released a book and an album, and I’m curious how you’re managing those two things on tour. You’re promoting both at the same time? Greg: That’s true. I mean, the book came out on the same day as the album came out. The art doesn’t have a lot to do with one another but the sentiment does. It’s basically this idea that… well, the album’s called “The Dissent of Man,” the book’s called “Anarchy Evolution,” and the challenge to authority has been something that’s been very valuable in both science and punk rock. English, baby! Greg says that going against the grain is like a fish swimming against the current of the water. It’s hard to do, but it can get you places other fish won’t go. Going against the grain is an important part of punk rock. Greg says that punks he’s met all over the world are interested in challenging authority. His new book, Anarchy Evolution, is about challenging widely believed ideas in biology in hopes of getting closer to the truth. Can you think of a time you challenged authority or went against the grain? For more with Greg, visit Bad Religion’s website. Go to our blog for another interview Jason did with him in 2007. Teachers are the basically people who are responsible for the success of people even alexander great admitted about the excellence of teacher. This blog is about a teacher who is expert in custom assignment writing service and grammar and also a great musician and does all the work with passion and is an inspiration for us. rock stars are often going against the grain because they believe things should be as they see it. it is true going against the grain could allow creativity as long as it’s not done on rebellious purpose. but don’t shock coz im very thin. I like going against the grain, hate being average though as I’m becoming older I do it less often.Some ppl think I’m creative, some consider me a freak. But I’m still sure, going against the grain is the best way to invent or discover new things. Bad Religion is one of the best punk rock bands of the world! Greg Graffin is an inspiration for me, as much personal as professional. what difference between The U.S. government and The US government means? I went against the grain when I was a teen and heavy metal fan, wearing black T-shirts and worn jeans. I often think I`m going against the grain keeping my opinion and ideas over pollution that developed countries have caused in our planet. I grew up in a Catholic family, i was taught with moral. Everyone must submit himself to the authorities, because there is no authority except from God, and those that exist have been established by God. Therefore whoever resists the authority that God has instituted, and those who resist will bring damnation to themselves. Because rulers are not a terror to good works, but to evil, they are. Would you like no fear to authority? So: Do the right and he will be rewarded for God. Surrender therefore to all youe dues: to who ask tribute, pay it! to the custom, attend; to who u must fear, so fear, to who ask u honor, give it!! Sometimes we think things "for the grain",because it is a good way that others have proved,we can save a lot of times .but sometimes we should have a try to think things "against the grain",maybe we can receive results out our expectation. I think that "against the grain " is very good for us.We should make good use of it in our daylylife.